AND DON'T FORGET TO WASH YOUR HANDS AFTERWARDS..."
Thanks for all your work on these. They are all so well packaged - labour of love it seems! 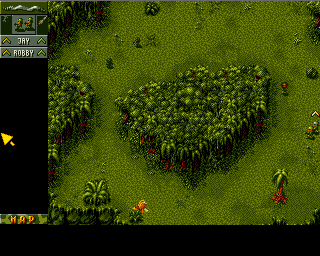 Apologies if this has been answered aleswhere in the forum but is it possible to create a blank disk that can be used as a save disk for Cannon Fodder? If so, can you post instructions on setting one up please? 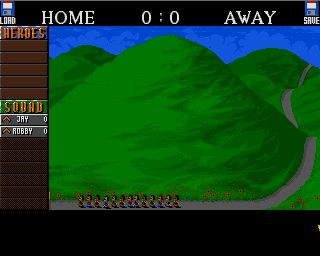 gareth wrote: is it possible to create a blank disk that can be used as a save disk for Cannon Fodder? If so, can you post instructions on setting one up please? You probably just need a blank floppy, which you format from the ADFFS filer menu. Don't forget to save it and then CTRL-SHIFT-F12 to quit out of the game and use Flush to write the changes to the image you created. So if I run format from the filer menu with first "insering" a disk, it creates a blank one? gareth wrote: So if I run format from the filer menu with first "insering" a disk, it creates a blank one? No need to mount a floppy first, ADFFS Filer Format will create a blank ADF in memory. Save will obviously save it to HD and Flush will write back any changes since it was last loaded. I'd suggest reading the help file, right click on !ADFFS and select Help from the menu. In case this is of use to someone else - I had the same issue with the save disk not working. 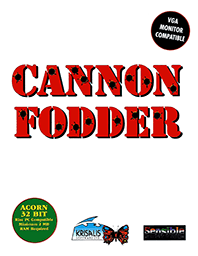 I looked around the internet and (mainly on Amiga forums) people confirmed that Cannon Fodder needs a specially formatted disk to save games, and I don't think we have one of them. At this point I tried running it and it complained it couldn't find Loader. So I copied the !Loader file out of !ADFFS and into !Cannon. On RiscPC and newer download packaged games via PackMan. Some boot scripts contain details on how to HD install the game, if it's not a straight copy to HD. Otherwise it's a case of copying all discs to HD and replacing !Run with the boot script, stripping off the first few lines that set Obey$Dir and/or change to ADFS. Where games have disc protection, you also need to add a line to ADFMount disc 1 and obviously put a copy of the image into the game folder. Single disc games that don't save settings or the highscore table aren't worth HD installing, just copy the floppy image into an app folder and make !Run ADFMount it and then ADFBootFloppy. However, we've packaged the majority of games as HD installs and would advice using them instead. No problem, if you're having problems with a game just ask and I'll do my best to assist. it complains it can't find Loader, but it can find it as soon as I copy Loader into !Cannon. Probably just coincidence as it's trying to load the game file "Loader". I'm not sure how it reported it couldn't find it in the first place, Can$Dir would need to be incorrect for it to fail. It details how to create a correctly formatted floppy in the manual on p11 (the PDF is in the full ZIP in the OP), that said I've not tried it myself. At a guess it's looking for a floppy with a "!Cannon.Games" folder on it.